Apple Watch Band - STINGRAY- more colors available - stainless steel and leather The band for the Apple Watch is made from stainless steel and high quality stingray leather. Highlights: - Available size up 8.1 inches (circumference of your wrist) - Butterfly Clasp - Fits 38mm or 42mm Apple Watches - Beautiful design & high quality Stingray leather NOTE: APPLE WATCH NOT INCLUDED. Apple and the Apple logo(s) are trademarks of Apple, Inc. This item is NOT endorsed by Apple®. 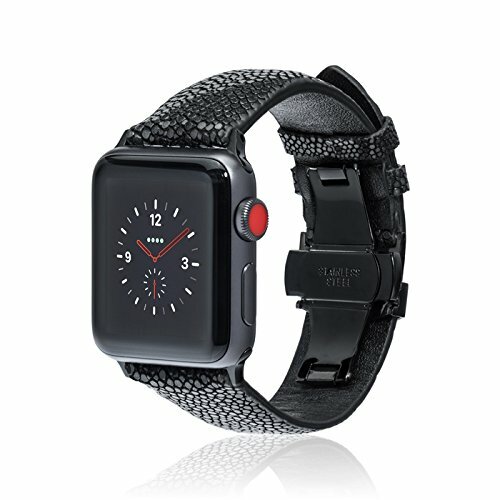 fitjewels® does not assume responsibility for loss or damage of any kind that comes to your Apple Watch while using this item. This bracelet is intended as an alternative to the traditional rubber band when dressing up your look and is NOT intended for wear during high impact or strenuous activities. Metal: high quality stainless steel. No tarnish. Fit Size: 5.5"-8.1" wrist, it can be men's or women's, comfortable touch feeling on your wrist, simple but attractive, look fantastic and giving a nice professional look on any occasion. If you have any questions about this product by fitjewels, contact us by completing and submitting the form below. If you are looking for a specif part number, please include it with your message.